I have long wanted to collect my thoughts, feelings and findings about the compost pile I have tended to, in various backyards around the country, for the past 25 years. My pile is an endless source of fodder, materially and spiritually. 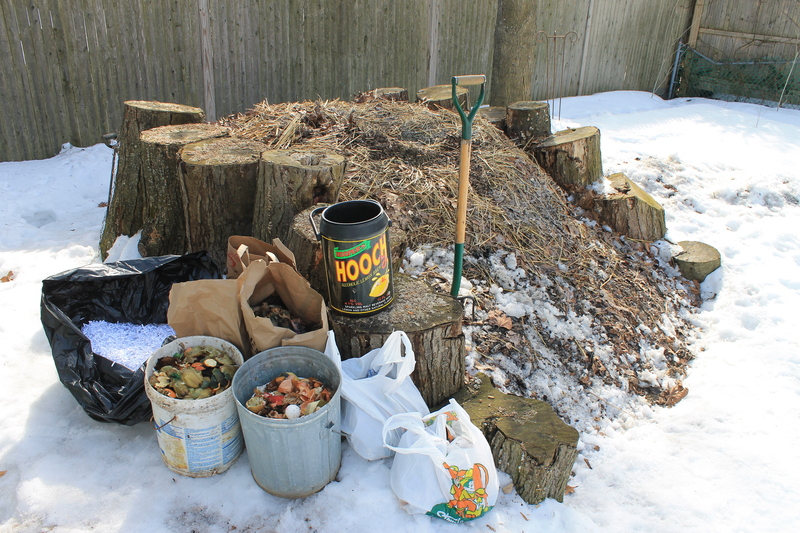 A compost pile is wonderfully useful to a suburban gardener. It’s recycling in its most elemental, home-brewed form; a hand’s-on effort at sustainability that sustains me with plenty of manual exercise the year-round. Set in the corner of a verdant backyard lot in the wooded suburbs of Fairfield County, Connecticut, my pile is well-situated. What my land and life produces and consumes, stays on the property, by and large. My pile also has the capacity to take in the organic remains and vegetative cast-offs from my neighbors, my work place, the coffee shop I frequent. It also reaps the rewards of the nearby seashore and local farms and stables. There are four full seasons to this land at its privileged latitude, and my pile continually stimulates me and my backyard as a bio lab of a project in which the profundity of one year’s bounty turns into the next year’s wellspring of continued growth. Each fall I gather the freshly dead ingredients of the growing season. Over the winter and spring the collection melds and molds and is amended into something new. Each summer I spread loads and loads of wheelbarrows full of finished compost across the garden and lawn, which in time returns its bumper crop of harvested life back into my pile. My pile weathers the seasonal swings in temperature, drawing strength and sustenance from the sun through the spring and summer and feeding off its own inner resources over the long cold months when everything else is dormant. My pile is a power plant, an internal combustion engine that produces enough heat to stoke it through the coldest stretch of winter. My pile is also blessed by regular dousings of water, as vital as air. Nearly 50 inches of precipitation falls upon this landscape each year, on average. Sometimes it’s in the form of a gully washer of a thunderstorm, other times it’s a foot-thick blanket of snow. Generally, though, this essential ingredient comes in nearly weekly doses of about an inch of water throughout the year. Making compost is an act of creation through destruction. Part plant, part animal, the domain of the multitude of microorganisms that make up the preponderance of life as we know it, my pile is an endlessly looping live performance that plays out through the seasons, according to my humble inputs and its own internal rhythms and processes. For my pile, I suppose the “spontaneous source” could refer to the trees that lord over my backyard lawn and garden, the dumpster bin full of coffee grounds, the beach lined by seaweed — or me. If you can’t exactly define something, the next best thing is to describe it, and in that regard, my compost pile is truly a little bit of everything. My pile is made of many things, like all these ingredients stockpiled through a winter storm and about to be added to the mix. There’s no exact recipe for making compost, and managing a compost pile is like being a baker who doesn’t have to follow a recipe to turn out finished product that by happenstance is somehow always just right. What a compost pile is and ends up as depends on where it’s made and what it’s made from. This weekend, I dumpster-dove for coffee grounds because the seaweed I gather from the high-tide line of our local beach is in short supply. It’s been a delightful fall; no early Nor’easters, just a steady decline in temperatures and daylight that have allowed the leaves to flutter to the ground at a steady pace. Each fall I construct my pile like I’m making lasagna, in layers. The pasta is the fall leaves, and these sort themselves out accordingly to their own schedule. The maples shed their leaves first, followed closely by the sycamores; last are the oaks. 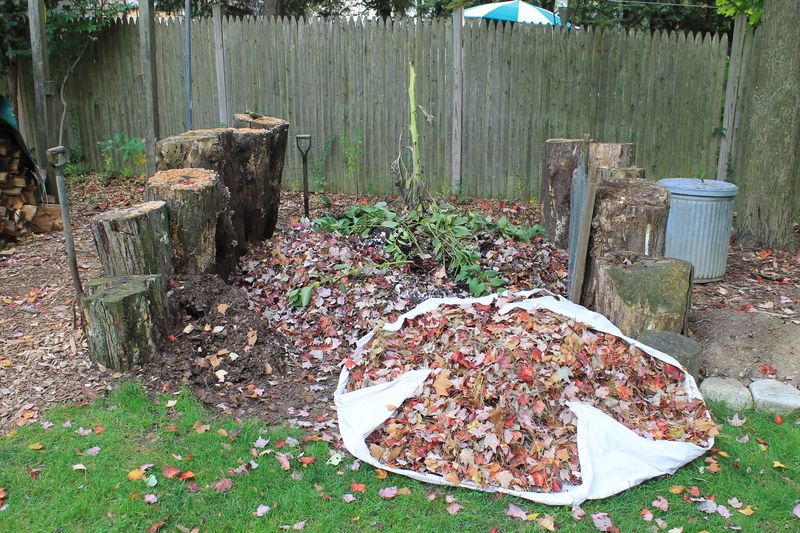 My favored form of leaf cleanup is to rake the leaves into a slouchy heap, lay an old bed sheet beside it, then pile the leaves over it until just the four corners of the sheet are visible. I gather them together and, like Santa Claus, sling the makeshift bag over my shoulder and haul it over to the heap I keep in the back corner of the yard. If the leaves are heavy with dew, then I have to drag the damp sheet across the ground. Either way, it’s quick and easy, and in short order — a load or two or three — you’ve got a clean sweep of a lawn and that much more organic material stashed atop my pile. A sheetful of leaves swept up from the yard and ready to be added to the beginning of my pile in mid-October. I’ve already tossed in the spent vines and stems from the vegetable garden, along with sunflower stalk. As it decomposes, the hollow stem will serve as a passageway for air and microorganisms, from top to bottom. But compost heaps don’t thrive on leaves alone — at least not mine. True, a pile of leaves alone will in time — a year or two in these parts — turn into leaf mold, a very good and basic kind of compost, to be sure. But where’s the fun, the art, in that? So along with every fresh deposit of leaves, I try to add a layer of some sweetener, a catalyst of high energy to inspire my pile to be more than humble leaf mold. In early fall, grass clippings are still in good supply, and what I don’t mulch back into the yard, into the pile it goes. Between mowings, there’s seaweed, hauled in big plastic buckets from the beach, or coffee grounds. Kitchen scraps, from my home or from one of my neighbors. Manure, brought home by the bin from a local nature center, nearby rescue shelter or riding stable out in the country. My compost pile is not mine alone; over the years my neighbors have gotten in on the act. The family of six next door contributes their kitchen scraps; the neighbors across the street have learned that it’s easier to haul their leaves over to my pile than to stuff them all into big paper bags for the town to pick up. In my experience, it’s the rabbit bedding — shredded paper, soaked in bunny pee — that is the favorite foodstuff of earthworms. When I turn the pile over I sometimes come across a remnant of recycled rabbit litter being feasted upon by a mass of wriggly red worms. Of all the living things in my pile, worms are my biggest allies. It’s funny to think of a worm as an apex predator, but they exist near the top of the food chain that is my pile. It’s humbling to know that it is their digestive tracts that in large part produce what becomes of my pile. So, in it all goes, layer upon layer, soldier after soldier. Water, air, sweat and the toil of countless things seen and unseen that eat and fight and live and die in situ. It’s all fodder for my pile.